Contrary to what Fisher's brother said earlier, Lucasfilm has confirmed that the actress won't be appearing in Episode IX in any form. Last week, Carrie Fisher's brother Todd Fisher said that he had given Lucasfilm his blessing to use footage of his sister in order to bring the Leia character to life in Star Wars Episode IX. But now, Lucasfilm president Kathleen Kennedy is saying that Leia will not feature in Episode IX at all. In an interview with ABC news (via The Hollywood Reporter), Kennedy said "Sadly, Carrie will not be in nine, but we will see a lot of her in [Episode VIII]." Responding to Todd Fisher's earlier comments, Kennedy said that he was "confused" and didn't know the full story. "Both [Billy Lourd and I] were like, 'Yes, how do you take [Carrie Fisher] out of it?' 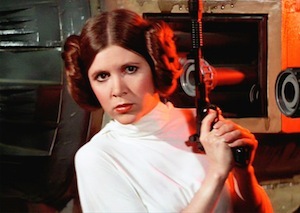 And the answer is, you don't," Todd Fisher said. So it looks like The Last Jedi, which had its first trailer drop today, will also be the last hoorah for Carrie Fisher.